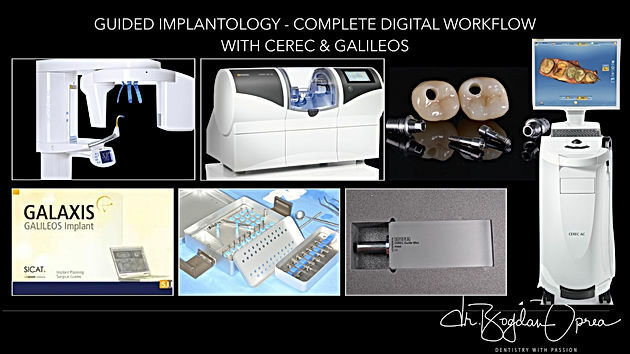 Digital technology and CAD CAM systems are starting gain their place in implant therapy not only in the prosthetic stage but also throughout the clinical steps of application of the implant. 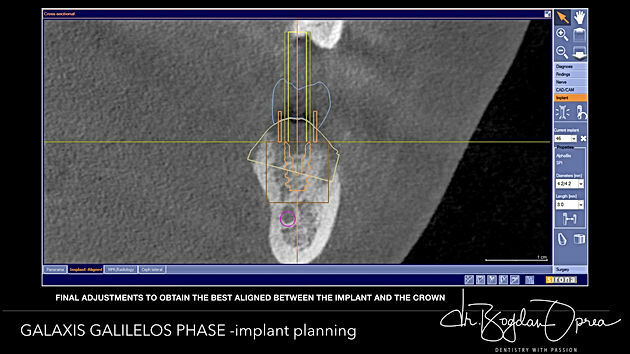 The use of CBCT examinations for implantology planning as well as the development of surgical guides that allow the insertion of implants safely and with great precision is no longer a novelty. We can safely say that the period of "free hand" implantology based only on a 2D radiological examination is nearing an end. 1. Radiological 3D examination (CBCT). 2. 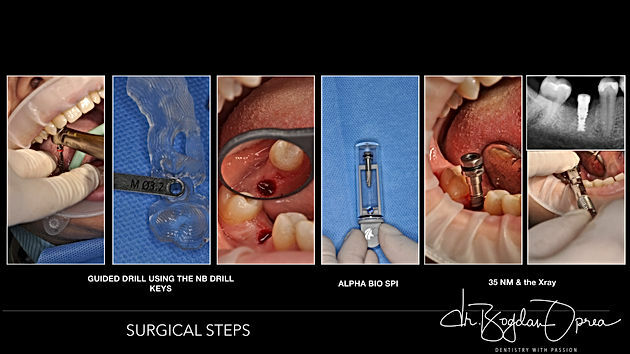 The use of the surgical guide for the insertion of the implants. 3. “Starting with the end”, meaning the use of the prosthetic project to perform the surgical guide so that from the beginning of the treatment the final prosthetic solution is used to plan the position of the implant. In "analogous" dentistry, harmonisations of all these criteria may often not easy due to the technically difficulties, and also because of the need for additional time for clinical and technical steps that increase the treatment duration. In digital dental medicine based on the use of CAD CAM systems, ensuring these criteria becomes much easier and faster. 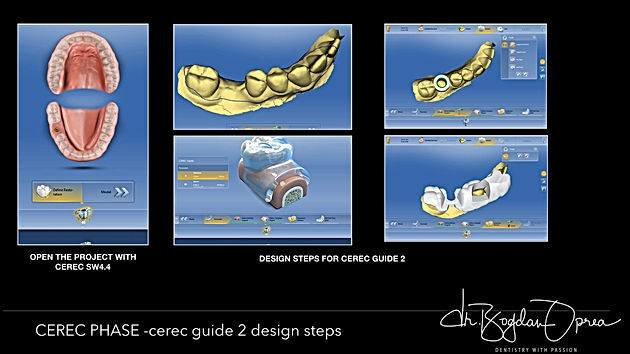 An example of this is the use of the CEREC system (Dentsply Sirona) for the fabrication of the surgical guide (CEREC GUIDE 2) based on both CBCT informations and the prosthetic project of the future prosthetic restoration. 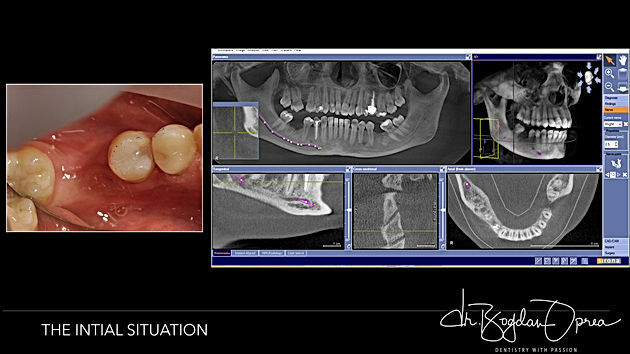 Next, we will illustrate through a clinical case the fully digital workflow for implant treatment. The P.E. patient, 24 years old, has presented for the treatment of a partial edentulous space generated by the loss of the molar 4.6, 1 year ago. The edentation has not been solved at all this time because the patient disagreed with the solution of the dental bridge (involving the preparation of the teeth) or with the implant because she was afraid of the surgical stage. 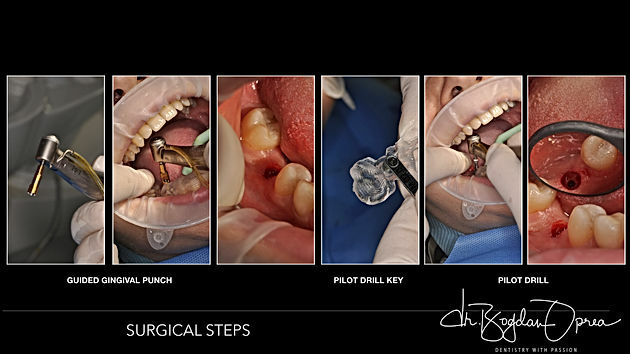 The use of a fully digital workflow will allow the transgingival application of the implant without the need for incisions, flaps and sutures, and implicitly all unpleasant effects to the surgical step. 1. 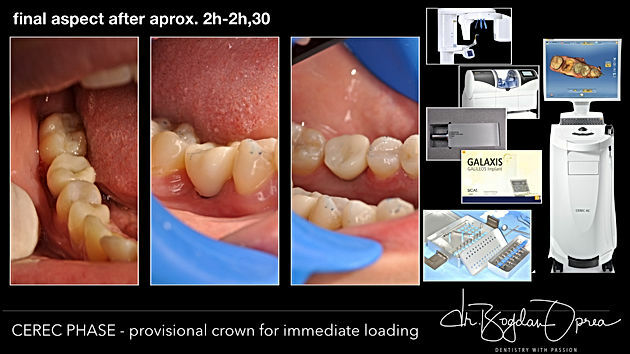 The CBCT investigation with Galileos (Dentsply Sirona). 2. Performing the optical impression with the CEREC Omnicam system using CEREC SW 4.4 software and designing the future prosthetic crown ensuring correct proximal and occlusal contacts with neighboring teeth and the antagonist teeth. 3. 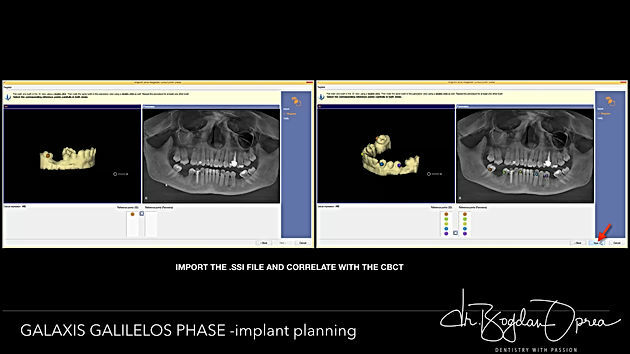 Exporting the prosthetic project as a “.ssi" file into the Galileo Implant Planing software where it will be superimposed on CBCT scanning. 4.1 Choosing the size of the implant (length, diameter) depending on the anatomical aspects (bone supply). 4.2 Positioning the implant according to the prosthetic project in such a way that allow to obtain the best possible co-respondent between implant and prosthetic axes. 5. The Surgical Guide project was exported as a “.cmg.dxd” file and opened with the CEREC SW 4.4 software. 6. Completion of the surgical guidelines design stage: Several parameters can be adjusted in this step to increase the precision of the surgical guide adaptation and, implicitly, the precision of implant application. 7. 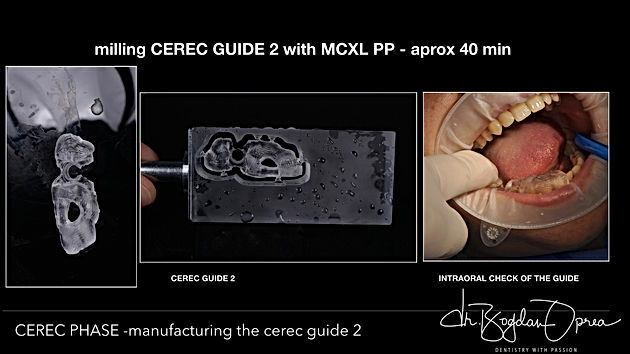 The surgical guide was milled from a block CEREC GUIDE maxi Block using the MCXL milling machine. 8. Intraoral check of the guide and verification of adaptation accuracy (using the visiting windows that were positioned during the design phase). 10 Use circular scalpel to achieve minimal mandibular bone discovery. 11. 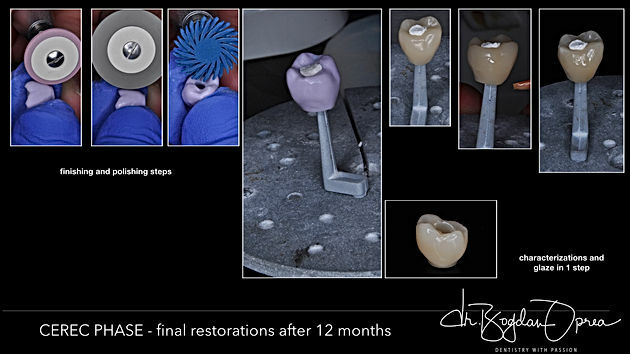 Using the CEREC GUIDE 2 sleeve set for the Nobel Biocare system to have a guided control of all the used burs. 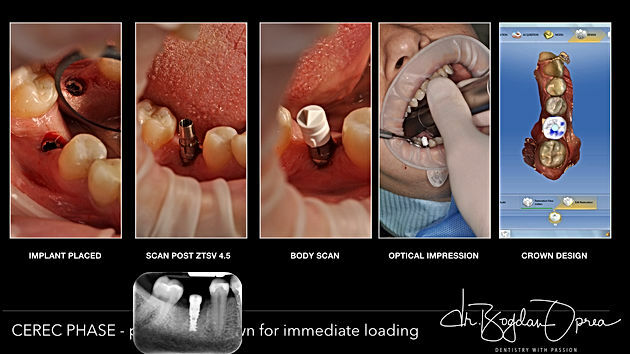 Although, in principle, CEREC Guide is only indicated for guidance of the pilot drill, in the case of implant systems for which there is a complete set of sleeves, the guided control for all burs can be ensured. 12. Implant application. An Alpha BioTec SPI implant of 4.2 mm diameter and 10 mm length was used. 13. 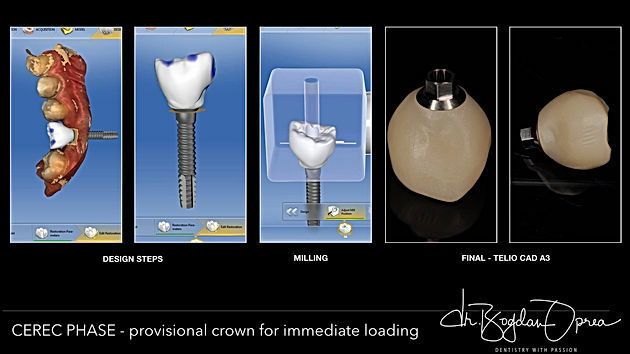 As a result of achieving excellent primary stability, it has been decided that immediate loading with a provisional crown is possible. 14. It was use a Scan Post system to make a new optical impression. 15. 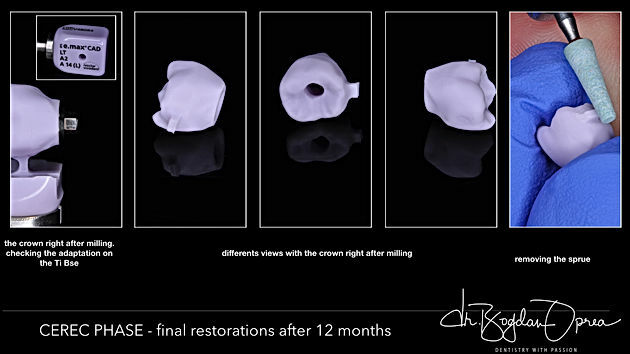 Design of the temporary crown using the CEREC SW 4.4 software. 16. Milling the temporary crown from a PMMA block (TelioCAd - Ivoclar) with the MCXL milling machine. 17. Cementation of the provisional crown on a Ti Base (Sirona ZTSV 3.5mm) using a Multilink Hybrid Abutment cement (Ivoclar Vivadent). 18. 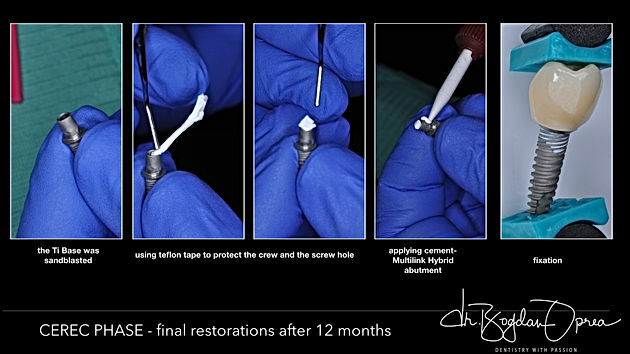 Screw the temporary crown and seal the screw hole with teflon tape and direct composite resin. 19.Verification of temporary crown protection in both static and dynamic occlusion. 20.Programming over 8 weeks for final prosthesis. 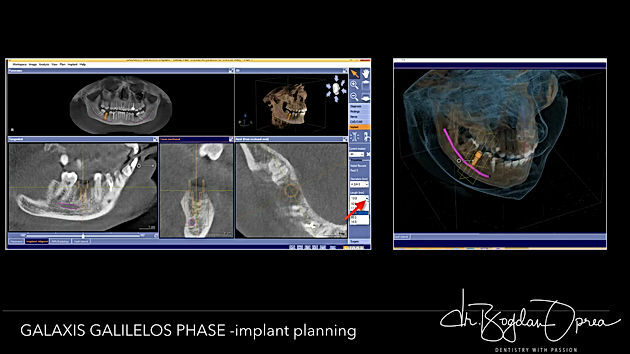 For reasons beyond our planning, the patient presented for the final prosthesis stage 1 year after implant application. 21. Remove the provisional crown. 22. 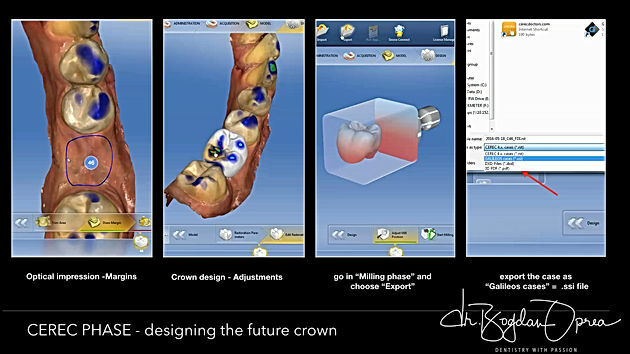 Make a new optical impression and designing the final crown. 23. Milling the final crown from an Emax LT A3 A16L block. 24. Finishing, polishing using the finishing system. 25. Crystallization, glaze and makeup in a single firing step. 26. Crown cementation on a suitable Ti base. 27. Application of the final crown and protecting the screw hole with teflon tape and coating the hole with a photopolymerizable composite. 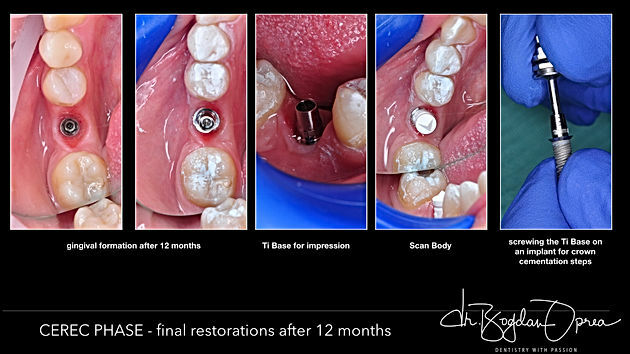 Results and Discussion: Using a complete digital workflow in implant therapy will increase the accuracy of intervention, shorten the duration of the intervention, improve the implant's better and faster integration. 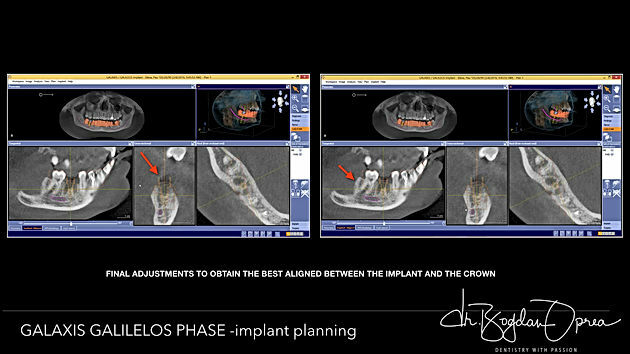 The great advantage of the method is the insertion of the prosthetic project into the implant planning phase. In this way a better alignment of the prosthetic and implantation axes can be achieved, simplifying the prosthetic stage and reducing the need for special abutments with various angulations. The lack of "classic" surgery with flap and suture will almost completely reduce the post-implantation secondary phenomena, which will make this type of treatment extremely well received by patients. Using the 3D milling or printed surgical guide will provide comfort to both the medical team and the patients. 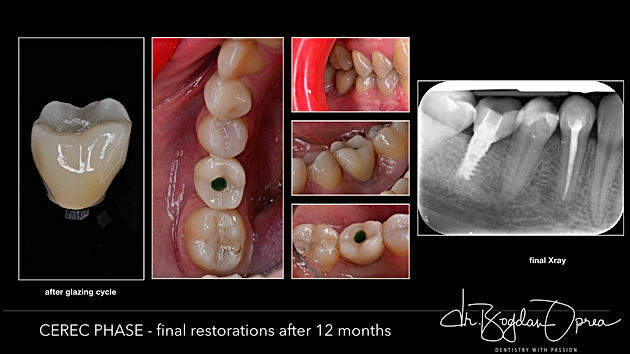 During the 1 year period since the introduction of this technique in our clinic, we found an increase in patient responsiveness to treatment plans with guided implantology. 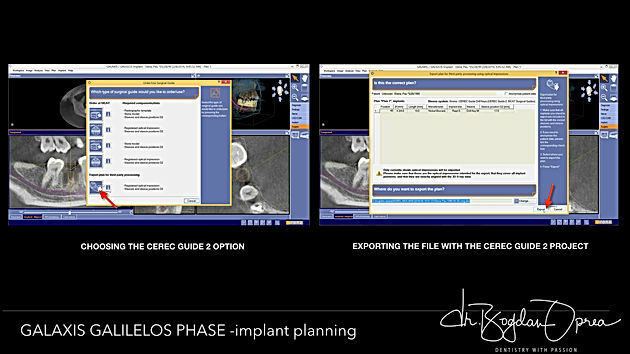 Although the system presented is designed for single implant surgery, it is possible to create surgical guides for the application of multiple implants using the Inlab15 / 16 software. The system is applicable for both simple and complex cases requiring augmentations or other additional interventions (external or internal lift sine, etc.). Of course, in the second situation, the intervention will no longer be "non-surgical" but will allow through the surgical guide to apply the implant exactly in the ideal position, with additional interventions being made only to ensure the implant integration in that position. This system opens up a great opportunity, especially for single tooth edentation (as described in this article). The single tooth edentation is one of the most untreat situation due to patient reluctance both towards the classical dental bridge (which requires the preparation of the neighboring teeth) and to the implant solution (fear of the surgical intervention and the associated secondary phenomena) . The authors believe that this digital workflow is the ideal solution to solve these situations and will significantly contribute in the next period to increasing the rate of treatment of this clinical situation.